Emalea Rupe’s works of art will be on display at the Markay Cultural Arts Center beginning Friday, April 21. Rupe explains that art begins with a thought, an image in the mind, as well as our perception of the world around us. 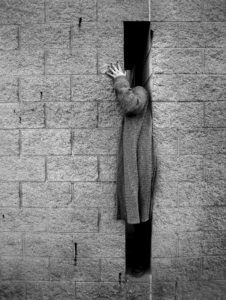 “Being a quiet person, interaction with others has never come easy. This exhibit is in part a creative view of what it feels like to be me, as I share ideas through painting, photography, and ceramics,” the artist added about her show. “Every aspect of our personality makes us who we are, whether it be a part of ourselves we share with the world or struggles we carry within. For some, outward interactions come easy, for others it does not. You re-think and over-think everything,” Rupe said. “With eyes closed you may become disconnected and somewhat invisible as others look your way but never really see,” she added. From Apple Grove, West Virginia, Rupe completed her Associates degree in Fine Art in 2013 and a Bachelor’s in Fine Arts, with a minor in Photography from the University of Rio Grande in 2016. She was introduced to art at a young age and decided to make it a career. She enjoys working on commission portraits and is currently taking on larger projects for local businesses in Rio Grande. Her works have been displayed in various shows, including several student shows at the Greer Museum at URG, French Art Colony, the Markay Cultural Arts Center Gallery, 409 Gallery, Point Pleasant River Museum, Marshall University, Huntington Museum of Art, Southern Ohio Museum and the Parkersburg Arts Center. She has also been involved in three Provost’s Academic Excellence Initiative projects and did a collaborated painting of the Welsh mural in Rio Grande, as well as a mural in Rio Grande Memorial Park. Recently, her drawing of Ann Griffiths was added to a poster displayed at a Baptist Church in South Wales. Meet Emalea Rupe on Friday, April 21 at 7 p.m. during the opening reception where she will discuss her inspiration and art practices. The opening reception is free and open to the community. Her work will remain on display until May 28. The Markay Cultural Arts Center is located at 269 E. Main Street, Jackson. The Gallery is open Wednesday through Friday from noon to 5 p.m. and Saturday and Sunday from 1 to 3 p.m. The Markay Cultural Arts Center is a project of the Southern Hills Arts Council, a non-profit organization whose mission is to be a vehicle for the community to experience the arts. For more on the Markay Cultural Arts Center visit www.markayjackson.org. The Southern Hills Arts Council (SHAC) Annual Flower Sale Fundraiser is underway! As you plan your gardens this year, or are looking for the perfect Mother’s Day gift, please remember to support SHAC by purchasing your hanging baskets and bedding plants through them. SHAC has partnered again with Marvin’s Gardens of Jackson to provide an excellent selection of beautiful foliage to fill your landscape. SHAC’s Flower Sale committee member, Cortney Leach and Director of Operations Jennifer Hughes visited Marvin’s Gardens and with the help and advice of the Marvin’s Gardens team chose wonderful varieties of hanging baskets and potted plants. 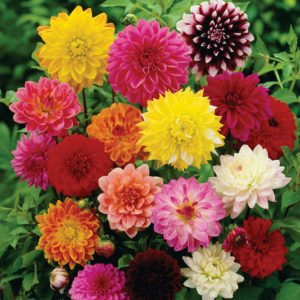 “I am so excited to see all the wonderful flowers once fully grown! The colors and varieties are just breathtaking,” Leach commented. The Flower Sale was debuted at the Jackson Spring Showcase with order forms being mailed the next week. SHAC’s Flower Sale allows you to pre-order from a selection of ten different hanging basket varieties in a twelve inch basket, a selection of ten different hanging basket varieties in a ten inch basket, including Boston Ferns and Bridal Veil; as well as flats of bedding plants such as Geraniums, Dahlias, Zinnias, Petunias, Vinca, Begonias, and much, much more. Those wishing to order can do so by visiting the Markay Cultural Arts Center located at 269-271 E. Main Street, Jackson Ohio or by visiting http://southernhillsartscouncil.com/annual-events/annual-flower-sale/. If you didn’t receive an order form through the mail Jennifer Hughes says not to worry. You can pick up the catalog and order form at the Markay. Orders are to be placed by Thursday, April 20 and picked up on Saturday, May 6 from noon to 2 p.m. at the home of Scott and Kayla Massie, 125 Gay Street, Jackson. Orders over $75 and within Jackson County, Ohio qualify for free delivery! Orders can be sent to Southern Hills Arts Council at PO Box 149, Jackson, Ohio 45640. Payment can be sent with the order by check or you can call us at 740-286-6355 to place an order over the phone and pay with a credit card. The Southern Hills Arts Council is an organization that works to enhance the quality life in the region by encouraging and stimulating the practice and appreciation of the arts. Supporting this fundraiser enables SHAC to continue to grow. If you have any questions please contact Jennifer Hughes, at jhughes@markayjackson.org, or call 740-286-6355. SHAC thanks you in advance for your support. Artist Karisa DeLay will have her ‘Bare Wings’ exhibit on display at The Markay Cultural Arts Center in Jackson from March 31-April 17. The artist explains that the ‘Bare Wings’ experience will be pieces of art that draw close to the artist’s passion for spiritual world and the emotions of the Angels surrounding us. 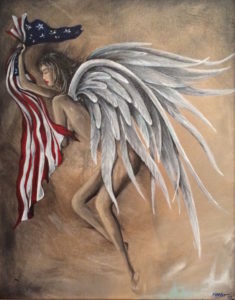 “Exhausted Freedom”, pictured, expresses the burdens we put on our Angels as we tug back and forth screaming “America”. The Angels that watch over us do so without prejudice, or judgment. This painting shows the emotional drain we put our guardian angels through during this rough road we have in America. The upcoming show for Karisa DeLay will be called ‘Bare Wings’ featuring the emotions of angels. DeLay is a full time wife and mother of four daughters, a salon owner/operator at The LOCAL Salon & Spa, a published author with two novels, occasional blogger at www.karisadelay.com , and the owner of The LOCAL Gallery in downtown Jackson, where she helps other local artists sell their art through the gallery and online. Karisa finds inspiration through those nearest to her and by the talents God has given her to share with those around her. 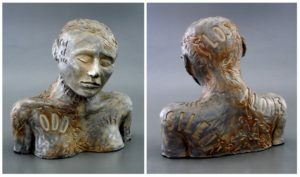 Meet the artist on Friday, March 31, at 7 p.m. where she will discuss her work and the inspiration behind the pieces. “Bare Wings” will be on exhibit from March 31 until April 17 in the Markay Gallery. There is not cost to view the exhibit. The gallery is open Wednesday to Friday noon to 5 p.m. and on weekends 1 to 3 p.m. It is also open during performances in the theatre. Viewings by appointments are also available by calling 740-286-6355. There is no charge to view the exhibit. The Markay Cultural Arts Center is under the operation of the Southern Hills Arts Council, a 501(c)3 not for profit organization, whose mission is to be a vehicle for experiencing the arts. For more visit www.southernhillsartscouncil.org or www.markayjackson.org. Pictured are members of The Dixie Swim Club cast. Pictured in front, from left, are Laura Miller as Lexie, Maria Hampton as Dinah, and Cassie Walker as Sheree. Pictured standing, from left are Elaine Wheeler as Vernadette and Lucia Colley Jones as Jeri Neal. The Riverby Theatre Guild’s production of “The Dixie Swim Club” will take the Markay stage on Feb. 26 at 2 p.m. 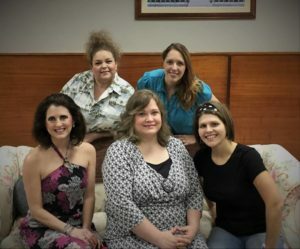 The comedy with a touch of southern charm, directed by Michelle Miller, takes the audience on a journey of life and friendship. Each August, college friends Lexie (Laura Miller), Jeri Neal (Lucia Jones), Dinah (Mariah Hampton), Sheree (Cassie Walker) and Vernadette (Elaine Wheeler) meet for one weekend in August, in a small beachside cottage, to share a weekend of fun and laughter, free of distractions. The audience is invited to join them as they catch up, laugh and help each other through life’s trials and tribulations. From ex-husbands and plastic surgery to life’s many up and downs, these five friends are there to talk each other through it all. The “Dixie Swim Club is a funny testament to the enduring power of friendship. 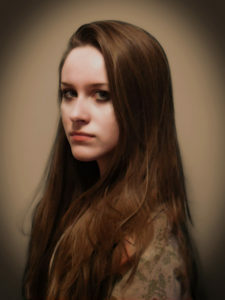 • Laura Miller (Lexie) – Is a newcomer to the area. Her past favorite performances include Gypsy (Electra), Plaza Suite (Karen), and Cat on a Hot Tin Roof (Maggie). When not on stage, you may find her walking dogs at the K-9 shelter or training for triathlons. • Cassie Walker (Sheree) has enjoyed being in and around theatre her entire life. She has been both in front and behind the curtain. From Bye Bye Birdie in High School, Plaza Suite in college, church venues and most recently the RTG fall production of Witches, Britches, Rings and Things. • Maria Hampton (Dinah) is thrilled to take the stage with this wonderful cast of ladies and terrific director, Michelle Miller. Being a part of the cast of Les Miserables was her first experience in musical theatre. Some of her favorite roles have been: Daddy’s Girl (Darlynn), Alibi’s (Hope), How the Other Half Dies (Officer Newbie). Maria is a mixed media artist and quite a bookworm. • Elaine Wheeler (Vernadette) is very excited to be “one of the girls” in the Riverby Theatre Guild’s production of The Dixie Swim Club. Her theatre credits include musicals: Emma! – A Pop Musical, Annie, Oliver and Fiddler on the Roof; children’s productions: The Little Mermaid and Alice in Wonderland; and comedies such as How the Other Half Dies and the Ladies of Harmony. As well as performing, Elaine also enjoys singing and teaching line dance. • Lucia Colley Jones (Jeri Neal) obtained her BA in Performing Arts from The University of Rio Grande. She is the Program Coordinator at The French Art Colony and Riverby Theatre Guild. She truly enjoys working with children in the arts. Some past favorite performances include: That Was Bob, Les Miserables, Sweeney Todd, Tommy, and more. As a classically trained soprano, her role as Monica, in The Medium, holds a special place in her heart. She is an actor, singer, teacher, wife and mother. • Michelle Miller, Dixie Swim Club’s Director, graduated from the University of Rio Grande with a degree in technical theatre. Since its inception, she has assisted the Riverby Theatre Guild as a director, techie and, on very rare occasion, a cast member. Over the years, Michelle has directed a variety of shows, including Misery, Wait Until Dark, A Christmas Story, Rednecks Undo Christmas, The Woman in Black, A Midsummer Night’s Dream, Alibis, Oliver and 12 Angry Jurors. She lives in Gallipolis with her husband Tim and children, Trent and Sydney. To purchase tickets, call the Markay’s Box Office at 740-577-3841 or visit www.markayjackson.org . Tickets can also be purchased at the Markay box office, Wednesday to Friday from noon to 5 p.m. The Markay Cultural Arts Center, under the care of the Southern Hills Arts Council, is located at 269 E. Main St., Jackson, Ohio. 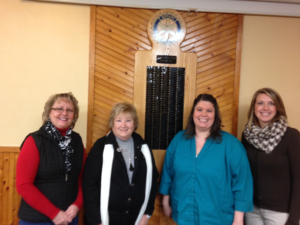 Pictured are Jackson Rotary Club program host Denise Brown, Jackson Rotary Club President Carol Porter, Southern Hills Arts Council Director of Operations Jennifer Hughes and Rotary member and Southern Hills Arts Council Board of Trustees member Amanda Crabtree. Denise Brown hosted the Jackson Rotary Club program for Tuesday January 10th. Mrs. Brown invited Jennifer Hughes of the Southern Hills Arts Council to review some of the exciting events and activities scheduled for the Markay Cultural Arts Center in 2017. Jennifer Hughes is the Director of Operations for the Southern Hills Arts Council. A number of special events are planned for the Markay Cultural Arts Center this year including the return of classic movies and popcorn. 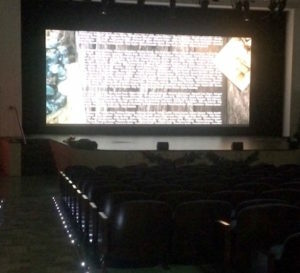 The first classic movie will be presented on a new 24 foot movie screen on Saturday, February 11th. Arts festivals, gallery events, children’s performances, tap dancing, tribute artists and bands, country, bluegrass, community choirs, comedians, classical guitar, and much more will be going on in Jackson thanks to the Southern Hills Arts Council. The works of both regional and local artist will be on display in the Markay’s gallery again this year. A total of 11 gallery shows have been scheduled for the Markay this year. In addition to new performers such as the Hotel California-Eagles Tribute Band, several very popular performers such as the Madcap Puppets and Elvis Tribute artist Dwight Icenhower will return to the stage of the Markay in 2017. Dwight Icenhower’s performance last year was the Markay first sold-out event, so you are encouraged to get your tickets early for Dwight Icenhower’s June 17th show. The Southern Hills Arts Council was established as a non-profit organization in June of 1981. It accepted the challenge of bring the Markay a 1930’s Art Deco theater back to life in 1996 when Rotarian Tom Evans was Mayor of Jackson. The arts council entered into an agreement with the City of Jackson to lease the theater for one dollar a year. The Markay was transferred to the arts council with the charge to renovate, maintain, and operate the Markay. Council members set out to return the Art Deco theater building to good operating condition with an eye to renovation, not restoration and it was always the intent of the arts council to save as many of the original features as possible and work without accruing debt. The renovation process took over the 18 years and two million dollars to complete. The grand reopening of the Markay took place in August of 2015 and today the gallery and 280 seat theater servers our community. 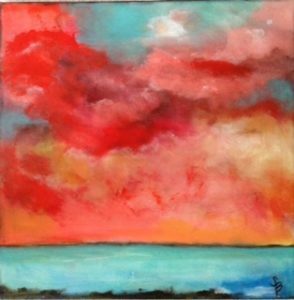 JACKSON– Jackson artist Sherry Betschel will have her work on display in a show titled “In The Moment” at the Markay Cultural Arts Center, January 6-29, 2017. Jackson artist Sherry Betschel will have her work on display in a show titled “In The Moment” at the Markay Cultural Arts Center, January 6-29, 2017. Betschel, a 1982 Jackson High School graduate, has been creating art in various forms, but it was not until 2013 that she started painting. She explains that she is an unbiased artist who likes to experiment with different types of mediums and techniques. When viewing her collection, one might be under the impression that her work was created by several different artists because of her diversity. Betschel explains that spiritual paintings, vibrant modern art, mixed media, abstracts and her haunting black and white portrait paintings with oversized eyes are just some of the styles included in her work. 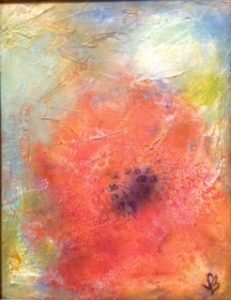 Betschel likes using texture and mixed media in a free form loose style and likes to use her fingers to paint. Mixing charcoal and acrylic is her favorite and began using ghe technique at the suggestion of a Grove City Chamber member, who saw one of her unique portrait paintings at an art show. Music is a huge part of Betschel’s creative process and most of her artwork was created while listening to classical music. She is a highly emotional person and carries her feelings onto the canvas when inspired by the challenges she has faced in her lifetime, spirituality, through nature, and poetry. She often incorporates Bible verses and poetry (some written by her oldest son, Jacob) into her art work. ’In The Moment’ is a diverse collection of artwork based on Betschel’s awareness with a conscious mind that is tuned into nature, emotion, and spirituality. Reminding us to slow down, take notice and reconnect. “’In The Moment’ is a diverse collection of artwork based on my awareness with a conscious mind that is tuned into nature, emotion, and spirituality. Reminding us to slow down, take notice and reconnect,” Betschel said. “I don’t think art should be purchased to match the colors of a room. I think art should be purchased because you have a connection to the piece or because it sparks some sort of emotion,” she added. “Nothing is more rewarding to me, as an artist, than for a person to connect to a piece of my artwork on an emotional or spiritual level,” Betschel ended. 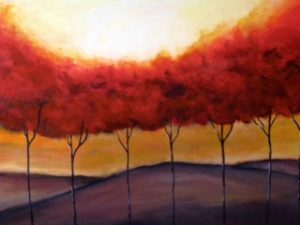 “In The Moment” is Betschel’s first art exhibit, but she has participated in art shows in Grove City, Columbus, Delaware, Cincinnati and Jackson. She has sold her paintings in Ohio, Vermont, California, Oklahoma, Arkansas and West Virginia and has painted several commissioned pieces. Most recently, a large commissioned abstract piece titled “Taken by the Sky II” for Children’s Hospital in Columbus. Betschel was born on Chanute Air Force Base in Rantoul, Illinois. She lived most of her childhood in Jackson and Wellston, and a few years in Scottsdale, Arizona and McArthur, Ohio. After graduating from JHS, Betschel studied at Rio Grande College before moving to Columbus. While living in Columbus, she worked in the accounting department for the Department of Transportation, choreographed fashion shows, one of which was for the Columbus Museum of Art, and taught modeling classes for several modeling agencies. She met her husband in Columbus and moved back to Jackson in 1997 to raise her two sons, wanting to be closer to family. The Southern Hills Arts Council invites the community to meet the artist on Friday, January 6 at 7 p.m. at the Markay Cultural Arts Center, 269 E. Main Street, Jackson. The Markay Gallery is open Wednesday to Friday noon to 5 p.m. and on weekends from 1 to 3 p.m. or by appointment by calling 740-286-6355.